A 19th-century businessman with an uncanny ability to be in the right place at the right time, Vincent Nolte had a long career on both sides of the Atlantic. He was a merchant, financier, caricaturist, medallion maker and writer. He made and lost more than one fortune, encountered Napoleon, Andrew Jackson, the Marquis de Lafayette, Queen Victoria and other luminaries, and left a highly entertaining book recounting his adventures. 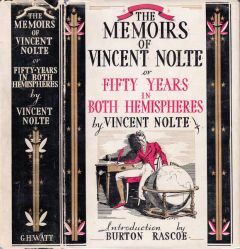 Vincent Nolte was born on November 21, 1779 in Leghorn (Livorno, Italy) to German parents. When Nolte was nine, the family moved to his father’s native Hamburg, where young Vincent received his education. In 1795, he returned to Leghorn to apprentice as a clerk in his uncle’s mercantile house. He was there when the French Revolutionary army invaded Italy, then under Austrian rule. In 1796, Nolte beheld the conquering General Napoleon Bonaparte in person. 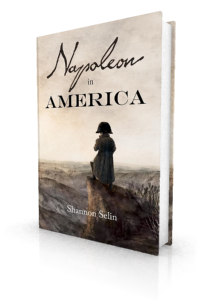 Napoleon upbraided Nolte’s uncle for appearing in what he mistakenly perceived as a British uniform – an anecdote Nolte recounts to Félix Formento and François Guillemin as they ponder Napoleon’s intentions in Napoleon in America. As you may have gathered, Nolte was no fan of Napoleon’s, particularly as he felt the Emperor mistreated Nolte’s friend, the French financier Gabriel-Julien Ouvrard. In 1805 Vincent Nolte travelled to the United States as the agent of a commercial house in Amsterdam. He spent the next 35 years going between America and Europe, travelling widely in the United States and living there for years at a time, primarily in New Orleans. He was there during the War of 1812, and fought as a volunteer on the American side in the Battle of New Orleans in January 1815. Later in 1815 Nolte was back in France, where he saw the Duke of Wellington. Nolte visited the battlefield of Waterloo nine months after the battle. He claimed to have as a guide the same peasant who had guided Napoleon. Nolte returned to New Orleans in 1816 and started his own commercial house, which speculated in cotton, among other things. Though he was one of the loudest critics of the Laffite brothers during the height of their smuggling escapades, Nolte had few qualms about providing arms and munitions to filibustering expeditions to Texas. He was also the Prussian consul in New Orleans. In 1819 he bought a house at 710 Toulouse Street, now known as the Court of the Two Lions for the figures that crouch atop the gate posts at the courtyard entrance. Around 1820 Nolte married Lisida Fevé, the daughter of a former French naval officer. He described his wife as “remarkable, not only for her rare beauty, but for good tact – that substitute for a powerful mind which good Nature grants to women.” (4) They had two sons, both of whom died in early adulthood, and three daughters, the youngest of whom died in infancy. In 1824, Nolte accompanied the Marquis de Lafayette on his voyage up the Mississippi from New Orleans to Natchez. In 1825 Nolte’s firm was caught out by a big drop in the price of cotton. In early 1826 he declared insolvency and had to liquidate his business to pay his creditors. 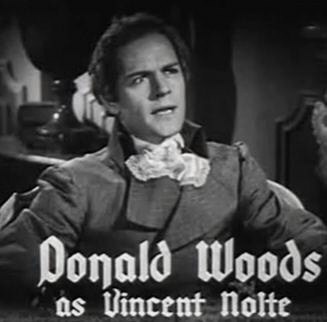 Vincent Nolte returned to Europe in 1829. He was in Paris during the July 1830 revolution that unseated Charles X of France. Nolte obtained a contract to supply arms to the War Ministry of King Louis Philippe. By 1834 he was ruined in this business thanks to untrustworthy partners. He travelled to Italy, winding up on a steamer with Napoleon’s youngest brother Jerome and the Countess Camerata (Elisa Napoléone Baciocchi), daughter of Napoleon’s dead sister Elisa. Notwithstanding his business career, Vincent Nolte had artistic leanings from an early age and was fond of drawing caricatures. He was a friend of the French painter Paul Delaroche. In 1832, Nolte started a business with Delaroche and others that involved a new method of producing copper-plate engravings. He produced prints that reproduced rare medallions and bas-reliefs. Now in London, Nolte’s next project was to make a medallion portrait of the young Queen Victoria based on sculptor Henry Weekes’ bust of her – the first of Victoria as Queen. Unrelated to the medallion, Nolte was imprisoned for debt in Queen’s Bench prison for three and a half months. He was released in time to see Victoria’s coronation procession. Nolte returned to the United States in late 1838. He resumed his role in the cotton business, and was briefly imprisoned for debt in New Orleans. In August 1839 he returned by steamer to Europe. One of his fellow passengers was Achille Murat, son of Napoleon’s sister Caroline. Vincent Nolte was thus back in Europe for the 1848 revolutions. Broke, he tried to better his circumstances by writing. He edited a free-trade journal in Hamburg, which had to close for want of means and subscribers. He published works including View of the Commercial World in 1846 and a revised edition of William Benecke’s System of Insurance (Hamburg, 1852). He also penned his memoirs, which were completed in May 1853 in German. The English translation – Fifty Years in Both Hemispheres; or, Reminiscences of a Merchant’s Life – was published in 1854. A mix of fact and fiction, the memoirs exhibit Nolte’s vanity as well as his storytelling ability and acerbic wit. As you can see from the selections above, Nolte claimed to have been directly involved in almost all the extraordinary events of his time. I recommend it to you: https://archive.org/details/inbothhemispheres00noltrich. Vincent Nolte died in 1856; I’m not sure where. He appears as a character in Anthony Adverse by William Hervey Allen (1933), which was made into a 1936 film starring Frederic March and Olivia de Havilland. Vincent Nolte, Fifty Years in Both Hemispheres; or, Reminiscences of a Merchant’s Life (London, 1854), pp. 28-29. The Athenaeum, No. 1399, August 19, 1854, p. 1009. Donald MacLeod, “The History of a Cosmopolite,” Putnam’s Monthly, September 1854, p, 328. The Athenaeum, No. 1399, August 19, 1854, p. 1013. You write that Vincent Nolte declared insolvency “in early 1826”. Do you know the exact date or a source by which this is verified? Nolte wrote a letter of introduction in May, 1826 for Audubon who was just leaving for Liverpool to seek a publisher. That letter to a sometime business associates, Wm. and Richard Rathbone, opened doors for Audubon which proved crucial to his ultimate publication of the Birds of America. I don’t believe that Audubon had seen Nolte since their time together in PA and KY at the end of 1811. Thanks, Robert. I didn’t realize Nolte had such an influence on Audubon’s career. Chance…has brought remarkable events, remarkable men and extraordinary business-combinations directly under my eyes, has kept my mental faculties in constant exercise and has made me acquainted …with a succession of distinguished personages.